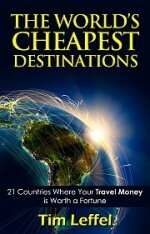 At the end of 2002 I published the first edition of The World’s Cheapest Destinations. If it sold a couple hundred copies I was going to be happy, but I put out there because nothing like it existed. I figured there was a market for a guide that put what would require weeks of research into one inexpensive package. Turns out there was quite a sizable market. I have revised it three times since, it came out in Italian even, and I turned down a couple offers to put it through a traditional publisher. (Less control plus less money didn’t seem like a smart move.) The book has become a perennial strong seller, a staple for round-the-world backpacking planners and vacationers looking for the best travel values on the planet. After an edition has been out a few years though, the sales start to slow down. People look at the date of publication on Amazon and assume the info is outdated. Most of it is not—prices don’t change all that rapidly outside of exchange rate differences—but I get the sentiment so I try to keep it fresh. This year I’m working on edition #5, which I hope to get out before December of this year. I just booked a flight to Sarajevo this summer to spend some time in Bosnia and Herzegovina, Montenegro, Albania, and maybe Kosovo. At least two of these will probably make the next edition. I’m looking at adding Georgia to the mix as well, but may have to rely on others for that as I’m not sure I’ll make it there in time. Later in the year I’m headed to Nepal and India as I haven’t been to either for a long time and want to get a first-person look at how things have changed in two of the cheapest destinations on the planet. I’m moving Mexico from “honorable mention” to its own chapter since the peso devaluation has made it cheaper than it has ever been before. You could get by for as little as $1,000 a month there in the interior if you were frugal and didn’t move around too much. Probably nothing. With the U.S. dollar being so strong right now, the only destination I featured in the current edition that might be more expensive now is Jordan. But that’s partly just because the tourist sites are priced so high. I’ll probably leave it in because it’s still a good value and they deserve the visitors for being a sea of tranquility in a really bad neighborhood. I’ll just have to change the “21 countries” part in the subhead to whatever the final tally ends up being. What’s Been Your Experience in the Cheapest Destinations? I always pay attention to the comments on this blog and people send me e-mails after their trips sometime with updates. For Americans the comments have mostly been “It’s even cheaper than you said in the book!” For Canadians and Europeans, there’s been more grumbling. When your own currency is in decline, it naturally drives up the prices elsewhere since you’re getting less bang for your euro or loonie. Regardless of where you earn your income though, leave a comment below if you’ve been to any of the featured countries in the past six months or so and noticed that something was out of whack in my overviews. Prices can and will change and though usually it’s gradual, sometimes a government policy change or market disruption can change things quickly. You can see the full table of contents if you click on “Look Inside” here on Amazon. Whether you’ve been to Indonesia or Laos, Slovakia or Guatemala, what did you experience on the ground that was a surprise to the upside or downside in traveler prices? My copy is at our home base in St Pete, Fl. but wanted to say not impressed with South Africa prices (currently there). Many are touting it as a great deal but we are not finding that overall. Cheap wine yes but harder to find non tourist restaurants that are lower in price. Of course better than it used to be but still doesn’t seem as cheap as some articles led us to believe. I haven’t purchased the latest copy because the places I get my information provide it for me largely in podcast format. I loved my experience in Brazil and want to return soon. After being there for 28 days, I can confirm that while the exchange isn’t as favorable compared to other Latin American destinations, the benefits out weigh the negatives. I could easily live in Sao Paulo for about $1,000-$1,500 US a month. To be honest that is about the going rate in much of Latin America. It’s just basics like imported cars and imported electronics have heavy taxes and fees. Clothes if not made in Brazil are also expensive for the same reason, as in some common foods in America that aren’t important to the typical Brazilian’s diet. Your solution there would work for younger people rather than older retirement types as frequent trips back to the US (as the rich Brazilians love Miami for the same reasons) to buy your clothes and electronics. If your car is less than two years old, you can bring it to Brazil and pay some fees but not nearly as bad as being in your 5-6 year old Acura, you’ll get hammered which is a deterrent to get you purchase a locally made car or used car built in Brazil. Those factors take Brazil off the list of many would-be expats. Which is actually a good thing, I didn’t run into another American my entire time there. Then again I was in SP not Rio which is where I would find most Americans anyway; sort of did that on purpose. Tim, I’ve read your book and I’m signed up for all the newsletters too, and they’ve been very useful in helping narrow my search for a place to settle, and not only stretch my retirement dollars, but provide an adventure and to find new opportunities as well. Between your books and sites like numbeo.com and expatistan.com, there is also a lot of good information to help determine cost of living and other useful info about your potential new home. That said, the one thing I wish you covered in more specific detail is the difficult process & often bureaucratic nightmare required in many countries on your list to attain long term visas/residence permits when planning to live there. This info along with a another potential major issue, that of determining whether the country they’re considering will tax their pension or Social Security benefits, and by how much. I understand there are countries that charge residents up to a flat 16% (or more) tax any kind of income for example, including pensions and S.S. benefits. This could be quite a serious financial blow & ultimately a deal-breaker for those who were planning to get by on the Social Security alone. I agree with everything that John mentioned. It would be very beneficial to have a comparison of the countries that you cover. The visa/residence requirements and tax questions are very difficult to wade through. Some more detail would be very much appreciated. I’m looking forward to the next “21 countries” edition. Thanks. That would have to be a more expensive book as this one is for travelers—not expats navigating living/working requirements. Not to mention long-term visa requirements are in constant flux. But thanks for the input. That’s sort of what the book Getting Out does already, though he advises in there that it’s only valid “at the time of writing” since these things keep changing. The World’s Cheapest Destinations is a travel book though. 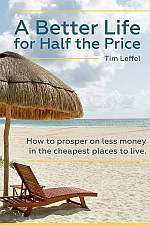 A Better Life for Half the Price is on Living Abroad. By necessity, it’s not super-detailed for every country. So for living in Ecuador, for example, it’s best to get a book (or hire a consultant/lawyer) just for living in Ecuador. Thanks for your support! Mexico is definitely OK for $1,000-1,500/month. I live in Oaxaca where my rents has been costing me $250-350 including frequent, even daily Housekeeping with a pool and all utilities, cable and WiFi. 2 Parks in 2 blocks, an Opera House, Community Swim Complex, 3 Mercado’s in the neighborhood and I stopped counting Coffee Houses as it approached 30. Everything walkable but Buses coverage is extensive and very cheap and Taxi’s are reasonable. Tina, my impression of that place is its a Brits holiday destination, like Ibiza, Mykonos, or the Algarve. Can you give us some examples for the bargains you’re talking about for travelers? I spent two weeks in Thailand (Bangkok, Koh Mook) and Cambodia (Siem Reap) in January, and I can attest that these destinations are still amazing values. Ate street food my entire trip and never once became ill.
Cambodia in particular is a great value. Entrees for $3, happy hour draft beer for $0.50 (full price $1), a half day in a spa for $30, and my tuk-tuk driver only cost $25-30 for an entire day of Angkor complex tours. My only warning for anyone going — street-hailed taxis in Bangkok will almost always refuse to use the meter with a whole host of ridiculous excuses. No matter how much protesting and actually threatening to get out (and I did a few times! ), it didn’t work. Use Uber or a taxi-hailing app (like Grab) to get a cheaper, more fair-priced ride. Uber to and from both airports from Siam/Silom clocked in around $11. I’m heading back to Oaxaca for the second time in two years later this month– this time taking my sister along for the ride!